Conspiracy theories, government corruption, and a really good mix of Prince drives David Corey to help solve the mysterious disappearance of a famous politician's son. When David realizes that the truth is much more dangerous than a kidnapping, he must battle ancient secrets that have endangered the lives of children for centuries. This conspiracy-fueled adventure story looks at the darker side of American history through the eyes of an unlikely team of heroes. If they fail, the American government and its people may not survive. 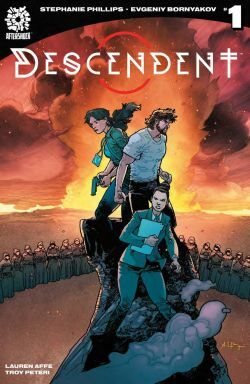 From AfterShock comes a new supernatural conspiracy series, Descendent, written by Stephanie Phillips and illustrated by Evgeniy Bornyakov, with colors by Lauren Affe and letters by Troy Peteri. DF wanted to learn more – and that’s not just a conspiracy theory! – so we sat down with scribe Stephanie Phillips. Stephanie Phillips: I am definitely not a conspiracy theorist, though I am interested in historical mysteries. When I was younger, I learned about the disappearance of the original Roanoke colony. I used to write fictional stories about all of the crazy things that could have happened to the lost colonists. Not that I believed any of these theories, but I found it a really interesting writing exercise to theorize about their disappearance. DF: What is the genesis behind your tale of Descendent? I am always fascinated when stories like this, which could be political intrigue or government corruption, are also mixed with ancient secrets and other things macabre. Stephanie Phillips: The story started with the Lindbergh kidnapping. I was reading about Lindbergh and noticed some really interesting discrepancies in the stories of those involved in the kidnapping and murder of Charles Lindbergh Jr. Mixed with the information about Lindbergh’s interest in eugenics, there are some really interesting conspiracy theories surrounding Lindbergh. I found this fascinating since most people conceive of Lindbergh as this all-American hero. His private life, however, reveals a much darker man than the public was ever acquainted with. Using Lindbergh as the jumping off point, I use the story to look at some of the darker aspects of America’s history, and even our present. DF: Who is David Corey? Can you give us a little feel of his life before this madness begins? Stephanie Phillips: David is a conspiracy theorist with a bad case of arrested development. While David might make a living investigating conspiracy theories for his online following, he is really likable due to his goofy demeanor. David doesn’t take himself too seriously and is rarely in a bad mood. Because David is open to the unusual and the unexpected, it’s easier for David to see connections that lead him to the trail of the missing children in the story. DF: Any other important characters readers need to know about as we pick up Descendent #1 in May? Stephanie Phillips: David may be the main character we follow, but the women in this story are really kick-a**. David’s ex-wife, Amanda Mansfield, is a high-powered attorney and gets thrown into the mix when David calls on her for legal help. Amanda is strong, independent, and really not in the mood for just about anything David says or does. Amanda begins an adversarial relationship with our other main character, FBI agent Joanna Hernandez (Jo for short). Jo is a more classic action hero with combat skills and weapons training on her resume. I really enjoy having three very diverse characters to place into conversation with one another. DF: Is the mysterious disappearance of a politician’s son just a MacGuffin here, or are these characters a vital part of the larger story? Stephanie Phillips: Everything in the book means something and matters to the larger story. There might even be a few Easter eggs placed throughout. DF: What can you say about the works of artist Evgeniy Bornyakov and colorist Lauren Affe here? Stephanie Phillips: I can’t say enough about how good they both are, that’s for sure. When I was working with AfterShock to find the perfect artist, we discussed the possibility of Evgeniy and it was a no-brainer to ask him to be a part of the book. I also really wanted to work with Lauren on the book. I knew her work and I knew she would be a great fit to color Evgeniy. DF: Stephanie, what other projects are you involved in, inside or outside comics, that you can tell readers about? Dynamic Forces would like to thank Stephanie Phillips for taking time out of her busy schedule to answer our questions. Descendent #1 from AfterShock Comics hits stores May 1st! For more news and up-to-date announcements, join us here at Dynamic Forces, www.dynamicforces.com/htmlfiles/, “LIKE” us on Facebook, www.facebook.com/dynamicforcesinc, and follow us on Twitter, www.twitter.com/dynamicforces.